March 2. 2010: Putting the fishing shows behind me, I took an ole friend from my home town, out on a little seek and find fishing trip, since we finally had a pretty day. It was a lot of seek since I had not been out in some time, but finally nailed down one of my ole fishing holes, and let him see how good he was at bringing in the "big one". He needed a lot of practice since he fishes out of Greenbelt Lake, but he finally got the hang of it again, and brought in some nice ones. It looks like the Spring Break coming up, will find Lake Texoma ready for the kids, and I am glad since I fish 20 of them in a couple weeks. I am posting a few pictures of yesterday, asking that if you have a free day or two, give me a hollar and lets go fishing , not hunting. March 4. 2010: same report, biggest this time to 12 lbs. Great fish, Great Day. For more information visit Jerry Dorsey's Cross Creek Guide Service web site. 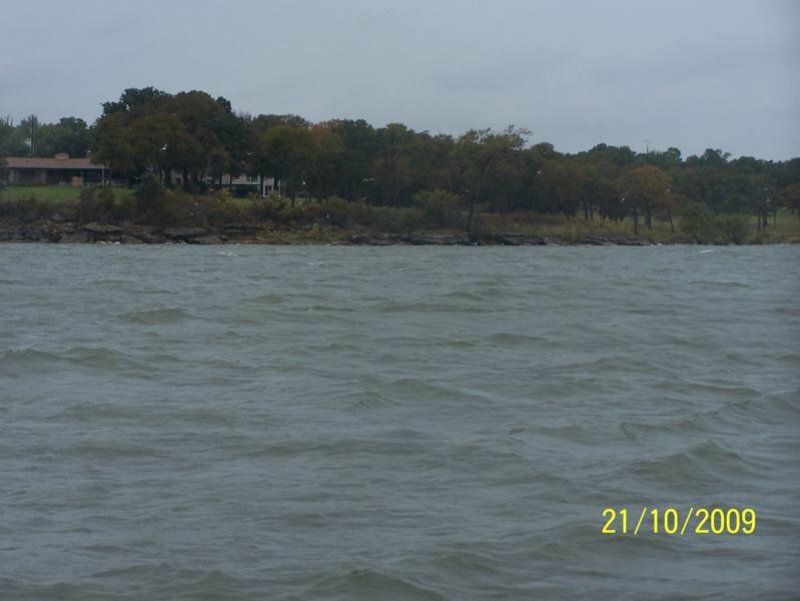 There wont be a lot of news during the winter months, as most guides do not fish in the extreme cold here at Lake Texoma. Today it is 12 degrees, minus 10 degrees wind child, so not a good day to be on the lake. My last trip last Wednesday, the fishing was skimpy, as fish were as sluggish as the live bait. I used Flukes and live bait, and had to work to get anything, although the six I fished this day, were avid fishermen from Alaska, and weathered the lake, much better than this ole senior. We went out of highport, west, where we found lots of fish, but few that active. 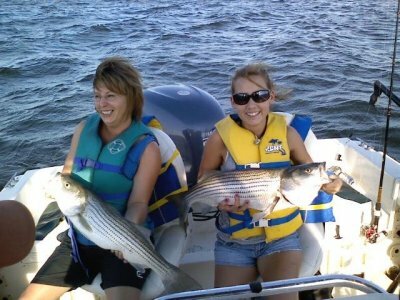 We tried lot of methods, but did not get our limit, but all-in-all we had a very fun time, pulling a few stripers and white bass. The fishing is still great but bait in my area is mostly non-existent. I have traveled some l hour to find it for my pending fishing trips. We have been anchoring on a ledge, 47-55 feet. and fish stayed with us, til we limited, and then burned bait, staying out on the water for the enjoyment of it. Lake Texoma is beautiful these days, with the water temp at 67; levels at 620.53; gates closed; sunrise, 6:49a and sunset 5:31p. We are catching our limits each trip, with fish gradually getting bigger, but still somewhat skinny. Trying to depart right at sunrise, hitting a few banks with artificial, for trophy fish, and checking some jug lines for those customers who request juglines. Going to be on the windy side this weekend 15-25 winds, and hoping can get at point where wind is not a problem. 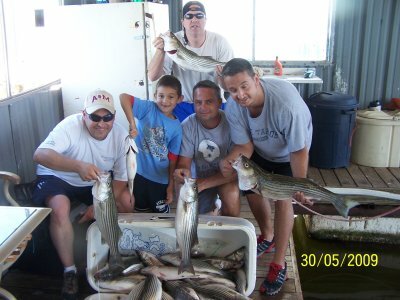 Fishing is good and think a new record striper was caught just recently. 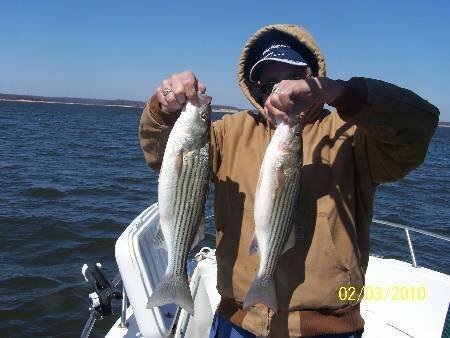 My dream is to get someone that new record for striper on Lake Texoma. "J.D." Beautiful fall days!. (23rd) Fished large group out Grandpappy, limiting early with mixed large, small fish.. Evening trip 8 cats on jugs, largest to 22 lbs. Next morning, limited early, with big fish coming back with water temps coming down. 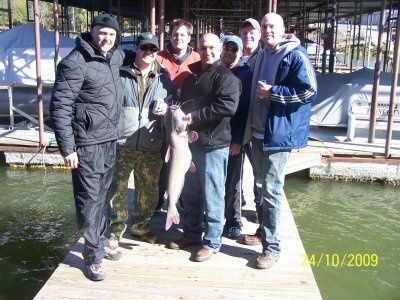 Another big catfish, ending with a great mess of fish for this group from Dallas. Lets go fishing………I mean catching……"J.D." 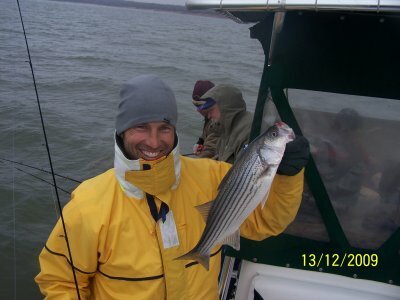 For more information visit JD's Cross Creek Striper Guide Service website. Fishing has been very good, with lots of trips ending with lots of fish but stripers on the small size, with the big fish skinny. 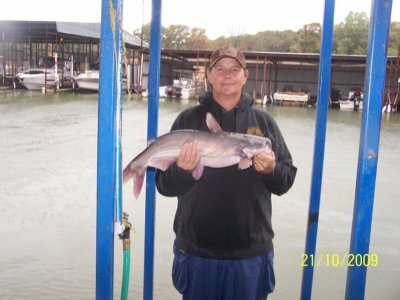 I have had lots of request for catfish juglines harvesting lots of big fish. Weather has been rainy & cool, but good. Last Sunday, we got a 46.9 lb. blue along with 21, 17, 12lbers., etc. Good thing Lionel and his crew helped me clean them or we would have been cleaning all night. They and other groups, Chilli and Son from OKC, are coming back for more next month….."J.D." Good Days, and not so good days. Saturday evening was a disaster, too many boats, and when did get it going, boats ran through us, running everything away. Catching lots of big fish, but limits hard to come by, throwing big fish back. I have had some good customers the last week, not to say they all arent good customers, but in this heat, they have all stayed the course, and gotten a lot of good fish. Had been doing good in evening, but with recent rain, I like the morning right now. We have been starting at the dam, and working ourselves south, with good topwater action (smaller fish) and using slabs and some bait, bringing bigger fish. Well some fish hitting top water now, and catching a few with slabs, so the artificial season will be upon us very soon. I am still using live bait, fishing the humps, and drops offs, catching good quality fish, all overs, (20 inch fish) and coming in with the best boxs, I have had in some time. I believe you could catch good stripers almost anywhere on Texoma. (if you know where to be). "JD"